My collection of divers watch must have a combined depth rating of close to 20,000 ft so I’m a little embarrassed to say that I’ve rarely ventured anywhere deeper than the bottom of a swimming pool. But even then a divers watch makes a lot of sense to me. They’re sturdy and very legible, you can wear them in the water without worries and most of them have a no-nonsense tool-like look which I find appealing. And the turnable bezel comes useful for timing all kinds of things. I love titanium watches so it’s no surprise that two of my favourites come from IWC, the company who pioneered the use of this material in watchmaking. 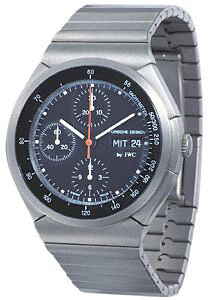 For many years, IWC made a line designed by Ferdinand Porsche, the first titanium watch which resulted from their collaboration was the Porsche Design Chronograph in 1978. But the real masterpiece that stems from this joint effort is the IWC Porsche Design Ocean 2000 from 1984. It so perfectly managed to combine futuristic 80’s design with the then very high-tech titanium, an unheard of 2000 m water resistance and a novel integrated bracelet that virtually just flowed into the case and was very easy to size. In the late 90’s the two parties went their separate ways. Ferdinand Porsche bought Eterna and continued to make watches while IWC brought out the GST line to replace the Porsche Design range. The Ocean 2000’s successor within the GST range turned out to be the Aquatimer, a watch with almost identical specifications but with a very different feel. Comparing the two, the most apparent difference is that on the Ocean 2000 everything is so organic and round while the Aquatimer shows distinct edges throughout. It’s almost like IWC kept all the engineering characteristics of the 2000 and completely did away with all of Porsche’s design elements. 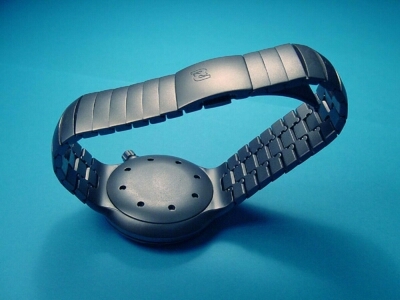 The result was a harder, more utilitarian and more functional watch. 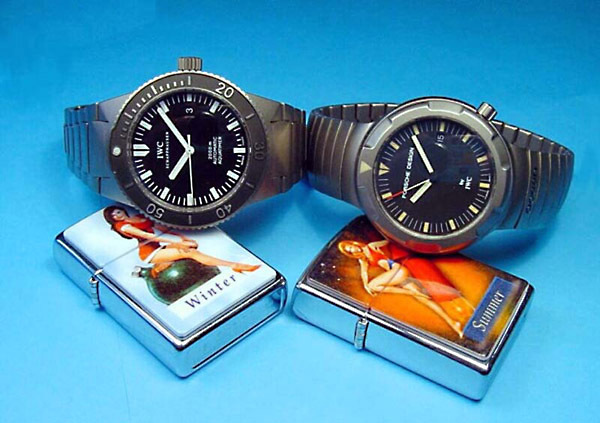 I could hardly believe it when I measured the two watches, the case of the 2000 is actually 2 mm wider than the Aquatimer’s 40 mm which worn on the wrist looks considerably larger. It is higher though, almost 15 mm compared to the slim 2000’s 10 mm. Both watches weigh exactly 120 g, another surprise as I would have thought the more dainty Porsche would be a bit lighter. Curves everywhere you look on the 2000. 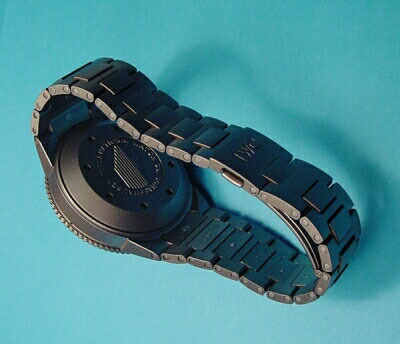 Note the way the bracelet is integrated into the case and how the lugs almost seamlessly extend the links of the bracelet. In comparison, lots of visible edges on the Aquatimer. 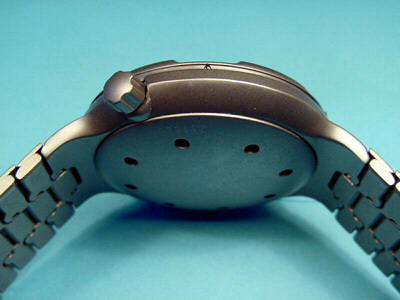 The thicker case back is almost solely responsible for the watch’s considerably larger height. The holes in the case back remain. They’re needed to fit a special tool with which the back can be screwed open and closed. 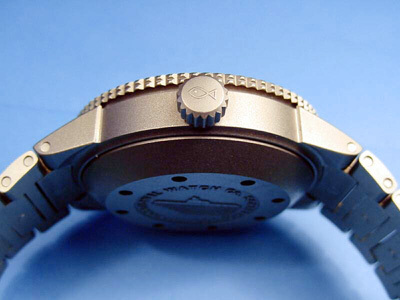 Both watches are water-proof to 2000 m and require such a system to securely tighten the “hatch”. 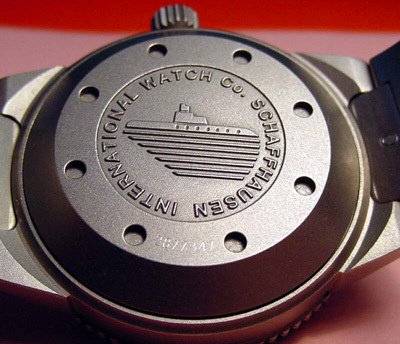 The only cosmetic enhancement made to the Aquatimer is the embossed submarine and signature. This addition was made possible by the more advanced machinery available today. In the early IWC/Porsche Design era, adding such a decoration to a titanium back would have been extremley tricky if not impossible to do. After mastering the initial difficulties which occured while working with titanium, nowadays it’s easier for IWC than machining steel. The metal just shouldn’t get too hot as the filings could start to burn. The secret is how to weld and solder it in a special inert gas atmosphere. …were replaced by clear cut edges. The 2000’s bracelet is much stiffer than the Aquatimers, almost like a bangle. It also tends to rattle a bit, especially when worn as loosely as I do mine. In my opinion the GST construction is one of the three best sport bracelets made today, the others being Blancpain’s X-71 and the one fit to AP’s Offshore. The bracelet of the 2000 requires a special two-prong tool which pushes the spring bars of the links open, resizing it is very easy to do. 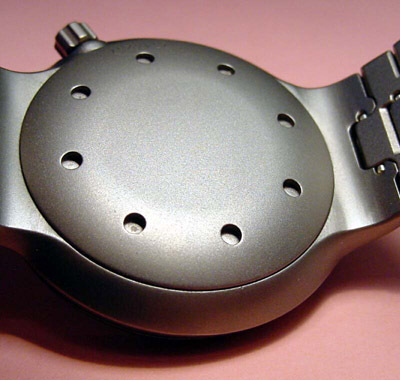 A similar improved system can be found on the Aquatimer, here the links can be seperated with any pointy object with which the small round disks in the middle of the links are pushed down.